Hungarian city. The oldest gravestone in the Jewish cemetery is dated 1636, and was erected in memory of Azriel Assach of Salonica. Between 1552 and 1716 large numbers of Spanish Jews settled in Temesvar, where the Turkish government received them with favor; but after the capture of the city in 1716 by Prince Eugene their treatment became less favorable, for Temesvar and its district were annexed to Hungary and administered as an Austrian province. In 1718 the provincial government ordered the expulsion of the Jews from the city on the charge of being Turkish spies. The order was not strictly enforced, however, on account of the influence of Moses Lopez Pereira Diego d' Aguilar, the founder of the Sephardic community; Maria Theresa even permitted five other Spanish Jewish families to settle in the city. D'Aguilar presented to the Sephardic community mantles of the Law and silver crowns for the scrolls of the Torah. At that time the Spanish Jews had a society for the promotion of the study of the Bible, while another association received official recognition from the Count of Wallis, the commander-in-chief of the citadel. As in Bohemia and Moravia, the Jews of Temesvar were oppressed by the restrictions formulated by Maria Theresa in 1776. Only forty-nine were permitted to reside in the city. They were restricted to a single community, headed by a dayyan and a rabbi; nor might they contract marriages or leave the city without the permission of the authorities. Only eight were allowed to engage in commerce; and the distinction between Ashkenazim and Sephardim was abolished, the whole Jewry being comprised under the term "protected Jews of the cities and counties of the Banat." Jews from other places were forbidden to enter the city except for commercial purposes, when they were required to pay a daily tax of five groschen for protection, and were obliged to leave the city at night. Jews were forbidden either to have Christian servants or to live in the houses of Christians, and were compelled to reside in a ghetto in the citadel, their quarter being bounded by the streets now called Varoshaz, Szerb, Erzsibet, and Jenö. Marriages might be performed only by the rabbi of Temesvar, and all Jews who died in the province were to be buried in the cemetery of the city. It was not until the reign of Joseph II. (1780-90) that the condition of the Jews of Temesvar began to improve. The community's most important society, next to the charitable organization, is the Jewish Women's Club of the citadel, one of the oldest societies of Hungary, founded by Sarolta Fischel in 1846. This is the famous Jewish society which gave Louis Kossuth 800 crowns for patriotic purposes on the outbreak of the Hungarian revolution. During the occupation of Bosnia and Herzegovina this society rendered valuable aid by sending food to the wounded; and at the time of the flood at Szegedin, in 1879, it materially assisted the poor, especially by maintaining a soup-kitchen. The community supports two other women's clubs, founded in 1847 and 1869 respectively, as well as the Talmud Torah (a charitable organization), the Maskil el Dal, and a ḥebra ḳaddisha, the last-named established in 1748, although its hospital in the citadel has since been demolished. 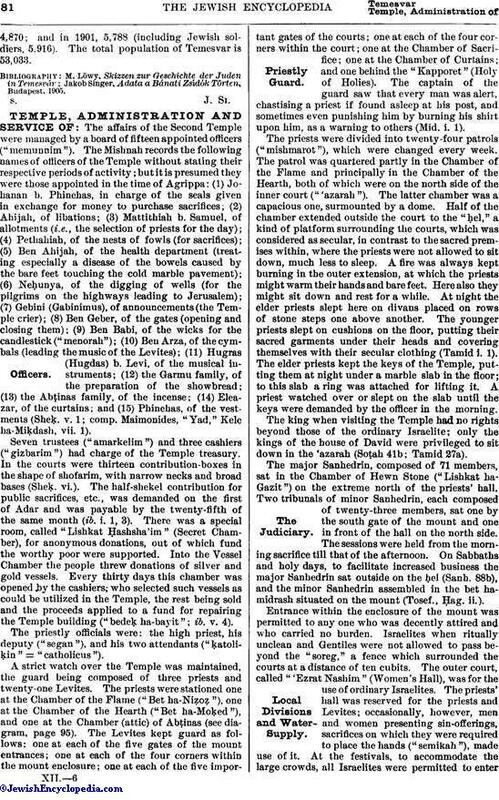 Temesvar has had the following rabbis: Jacob Moses of Belgrade (Sephardi; 1739); Eliezer Lipmann, author of the commentary "Migdal Dawid" (1748); Jonathan Trebitsch, chief rabbi of Transylvania (1752); Johanan b. Isaiah (1775); Ẓebi Hirschb. Israel (Hershele Ḥarif; 1782); and David b. Ẓebi Oppenheim (1801), and his son David Hirsch Oppenheim, author of "'Ene ha-Da'at" (Budapest, 1829). The rabbinate of Temesvar has always included the entire district composed of Lugos, Versecz, Karansebes, Pancsova, and Nagy Becskerek. In 1863 Moritz Hirschfeld was elected rabbi, and was succeeded by Moritz Löwy. Since 1860, however, internal dissensions have divided the community into factions, with the Reform rabbi, Moritz Löwy, at the head of the one in the city, and the Orthodox rabbi, Jakob Singer, leading that in the citadel. 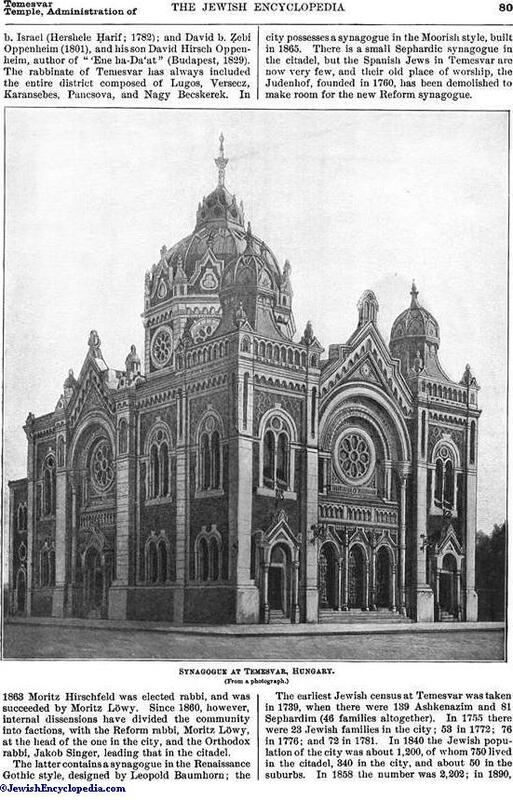 The latter contains a synagogue in the Renaissance Gothic style, designed by Leopold Baumhorn; the city possesses a synagogue in the Moorish style, built in 1865. 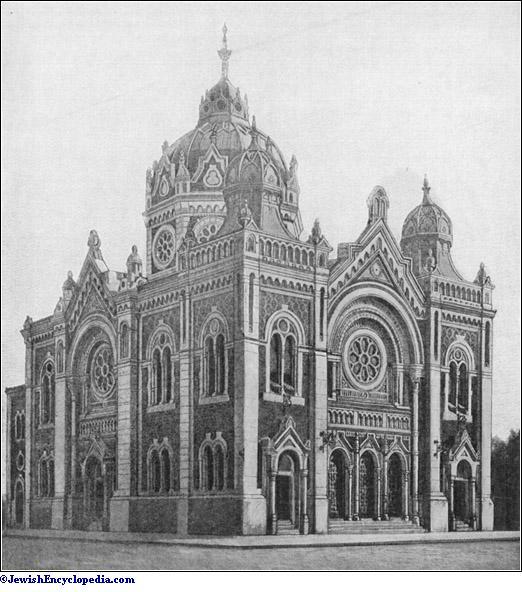 There is a small Sephardic synagogue in the citadel, but the Spanish Jews in Temesvar are now very few, and their old place of worship, the Judenhof, founded in 1760, has been demolished to make room for the new Reform synagogue. 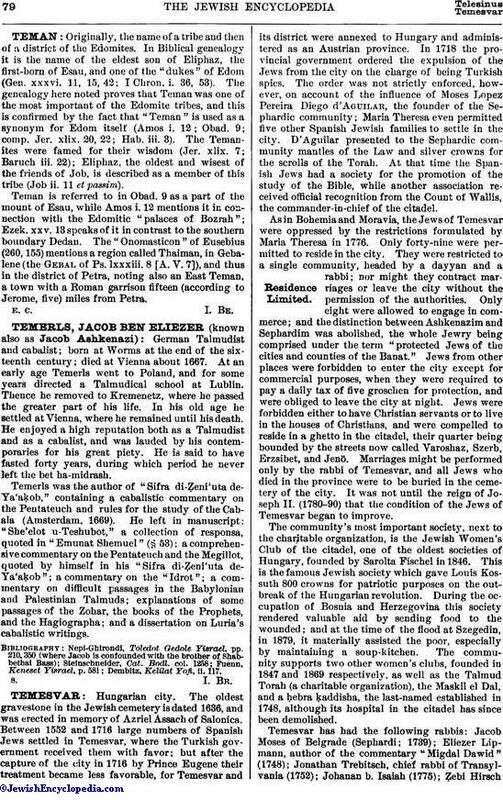 The earliest Jewish census at Temesvar was taken in 1739, when there were 139 Ashkenazim and 81 Sephardim (46 families altogether). In 1755 there were 23 Jewish families in the city; 53 in 1772; 76 in 1776; and 72 in 1781. In 1840 the Jewish population of the city was about 1,200, of whom 750 lived in the citadel, 340 in the city, and about 50 in the suburbs. In 1858 the number was 2,202; in 1890,4,870; and in 1901, 5,788 (including Jewish soldiers, 5,916). The total population of Temesvar is 53,033. Jakob Singer, Adata a Bάnati Zsίdόk Törten, Budapest, 1905.